For The First Time Ever! 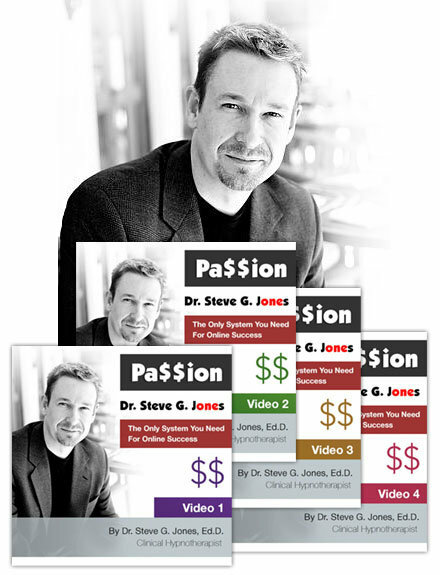 Dr. Steve G. Jones Shares His Four-Part Online Success Process with easy-to-follow Online Marketing Videos. 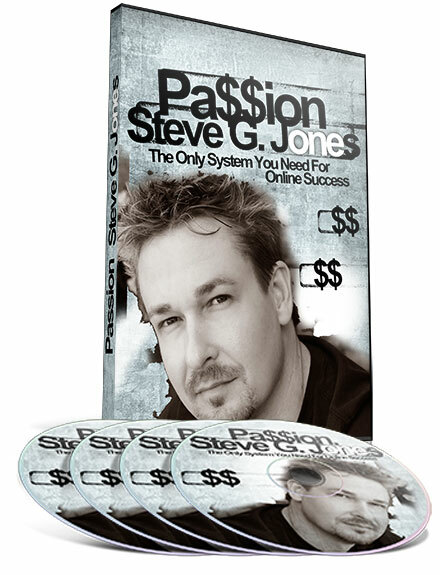 The Only System You Need For Online Success! Passion is not enough. But without it, you are doomed to Failure – Financially, Spiritually or both. You were put on Earth to fulfill your purpose. And the secret to finding your purpose is identifying what you are passionate about. You can make a lot of money doing things you hate. The result? Depression, Self-Sabotage, or Disease (Dis-Ease). You can be very Passionate about something, and despite your best efforts, be incredibly poor. Unfortunately, this is where 99% of entrepreneurs find themselves. They don’t believe they can make money following their passion, so they compromise and 10, 20 or 30 years later? They come to see me as their Clinical Hypnotherapist. Today, I want to save you from that fate. Don’t get me wrong. I firmly believe that Hypnotherapy is a powerful, effective way to overcome many of the obstacles that challenge us on a daily basis. But today, I want to marry your passion with your abundance. As you have watched the 4 videos that brought you here, I hope you realized that my success was the result of my discovering a simple, easy-to-follow system that took my business to another level. Every day, I am grateful for the challenges that proceeded my “Eureka” moments. For without them I never would be where I am today, but I still wish I had someone who had taught it to me… and speeded up my progress. The Good News? You don’t have to go through that painful process. I have taken my system and broken it into four 20-minute online marketing videos. Each downloadable video covers the most important aspects of each step of my Pa$$ion Profit Process. My videos cover why you can make it online and what you have to do to succeed. But if you miss out on even one of my steps, you may find yourself struggling…. The key to living a worthwhile life is living with Passion. As you watch the videos, you will discover exactly why what you are passionate about is so important to your business. If you try to build a business based on what you think will make you money instead of what you are passionate about, you are building a mansion made of sand, on a beach. The first high tide that comes in…it’s gone! It has never been easier to make products than it is today. I will show you how you can make products in literally minutes, no matter what your passion is. – Raymond E. Lawrence, Ph.D. The good news is even if you don’t have any customers or even prospects, you can be selling to thousands of people very soon. This is one of the main reasons I am so excited about the Internet. Pa$$ion gives you a complete, easy-to-follow plan for turning your Passion into Pa$$ion. In 80 minutes, you will know exactly what to do and how to overcome your biggest obstacles (and believe me when I say, they aren’t figuring out your passion, nor getting sales). If for any reason, after watching each 20 minute video, you are not absolutely convinced that by following my system you can change your financial situation, let me know and I will cheerfully refund your purchase. Because I know after using my system for the past 15 years, it works. And it works like a charm. So don’t delay. Don’t put off your success another day. Act now and start on your journey to financial success. But you can claim your copy today for only $19.95 (however I reserve the right to change the price at any time). With these four online marketing videos, you’ll discover everything you need to make your business super profitable! If you wrote a book, recorded an audio class or shot a video course and wondered why you couldn’t sell it online, then this powerful course is for you! I explain everything you need to turn your Passion into $$$. 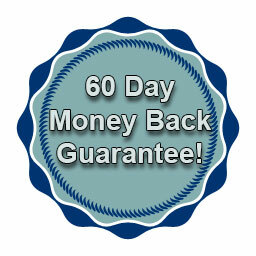 The world needs your expertise and in 80 short minutes you could have the plan that skyrockets your business. You can be watching and learning in less than 10 minutes!